Opening with a spark, freshman Brooklyn Williams plays the spunky Butch and instantly engages the audience rambling out a story about a man and his catchphrase “I know everybody and everybody knows me.” As the characters are introduced, they interact in a dynamic reminiscent of ping pong balls (or rather basketballs) knocking into each other. Often instigating this dynamic is sophomore Samara French, (playing the sassy and strong willed Shelby) who manages to pull off an impressive amount of energetic lines and expressions without looking absurd. Next, playing the humble Wilma, sophomore Allie Poole does an excellent job showing her character torn over being the chosen favorite despite the others’ greatest efforts. Portrayed skillfully by junior Carmen Kerr, the seemingly prudish character of Charlene wins the heart of the audience as her undeniably empathy-inducing human flaws are slowly revealed. The wonderfully talented senior Nicky Clary is the singular male actor who portrays team leader Cassius. Through Clary’s remarkable acting, Cassius’s antagonistic character comes alive with condescending lines like “let’s see some smiles,” along with body language that subtly yet effectively illustrates his perceived dominance over the women, both of which made everyone in the audience squirm a bit in their seats. 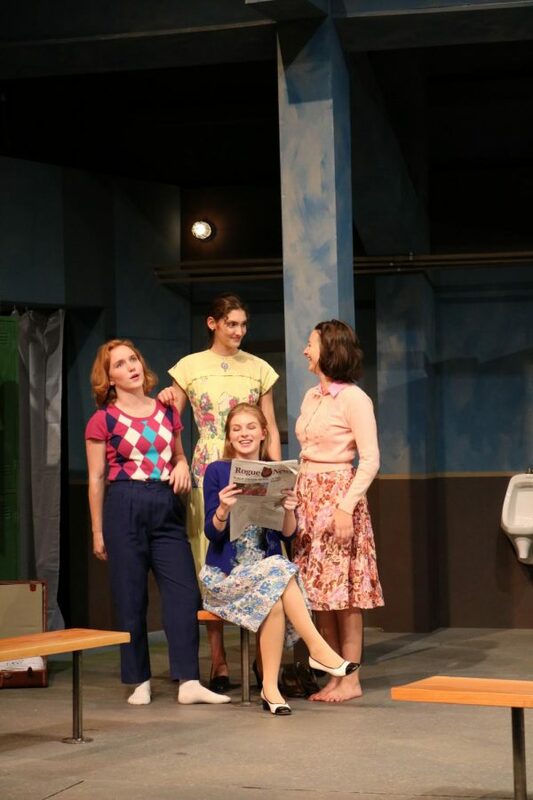 Supporting roles (along with Butch and Shelby) are sophomores Anabella Ross as the independent Gay, Kylah Ward as the “mom of the group,” Birdie, and junior Elena Schmeling whose personality shines through her sweet and indecisive character Tammy. Left to right is Allie Poole, Anabella Ross, Elena Schmeling. Center is Samara French reading out sexist reviews written by the men’s team. Photo by Zeleyha Mata. Being that “Shooting Stars” is set solely in a locker-room, I was surprised that the scene didn’t bore me to death. Expertly designed by OSF’s Richard L. Hay, the genuine layout and random display of personal belongings allows the audience to feel like they are watching the private inner workings of a women’s locker room (non-creepily) while also being excluded from memories and inside secrets that have taken place there. Thanks to Bart Grady’s expertise in lighting, the set’s warm glow enhances the characters’ soft yet striking appearances and creates a vibe like that of a 1960s film. Props such as Twinkies, clapping monkeys, and Christmas trees wrapped in toilet paper are both engaging to the audience and realistic. Cast members were dressed in splendid 1960s attire (courtesy of OSF costume designers Emily Ehrlich Inget and Cherelle Guyton) and complemented with makeup which enhanced their natural beauty. Judging from the numerous pauses for laughter, whoops, and ending with a standing ovation, it’s safe to say that viewers thoroughly enjoyed this heartwarming play. Through the combination of seasoned actors interacting with newcomers, well paid-off risks with choosing a single set design and the overarching theme of women stepping into their power, I give “Shooting Stars” an overall score of 4/5 stars. Walking away, I am pleased to say that my preconceived judgment suffered a sore loss against these stars in the making.